YOU REPRESENT, ACKNOWLEDGE AND AGREE THAT YOU ARE AT LEAST 18 YEARS OF AGE OR THAT YOU ARE THE PARENT OR LEGAL GUARDIAN OF A USER THAT IS AT LEAST 13 YEARS OF AGE, AND YOU AGREE TO THESE TERMS. IF YOU ARE THE PARENT OR LEGAL GUARDIAN OF A USER OF THIS SITE AND/OR PRODUCTS AND YOU HAVE QUESTIONS ABOUT THIS SITE OR THESE TERMS, PLEASE CONTACT US VIA THE OFFICIAL FAWNS SUPPORT PAGE. Socializing LLC is the sole owner of the "Fawns Logo" (the word fawns, with the side lines of the "w" extending higher up to form "deer antlers"). You may not make use of our Official Logo in any way shape or form without first getting written consent from Socializing LLC. Any person(s) found using the "Fawns Logo" without prior consent from Socializing LLC will risk being removed from "The Fawns Breedable", and affiliated breedables, permanently - as well as be facing legal action, depending on the determined severity of the situation. Licensees (people we grant the ability to use our Official "Fawns Logo") are allowed to use our logo so long as they keep the "TM" intact, and do not modify the "Fawns Logo" in any way shape or form. Licensees are only allowed to place our logo on content that uplifts "The Fawns Brand". Any use that promotes defamation of character towards Socializing LLC, will immediately be voiding any and all prior licenses you have with Socializing LLC. 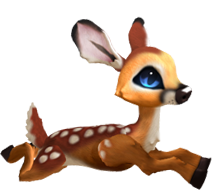 All users are allowed to make use of the word "Fawns" in their advertising, group names, sim names, etc. - so long as the usage does not promote defamation of character towards Socializing LLC. NO ONE IS ALLOWED TO PROMOTE AN ITEM, GROUP, EVENT, SIM, WEBSITE, ETC. AS "OFFICIAL FAWNS". NO ONE IS ALLOWED TO CLAIM TO BE FROM "SOCIALIZING LLC" / "FAWNS TEAM". ALL ACTS OF THIS RISK IMMEDIATE LEGAL ACTION AS WELL AS VOID ANY/ALL PRIOR LICENSES WITH SOCIALIZING LLC, AND RISK REMOVAL FROM THE FAWNS BREEDABLE, AND AFFILIATED BREEDABLES, PERMANENTLY. FAWNS is an unregistered trademark of Socializing LLC. Other trademarks, names and logos on this site are the property of their respective owners. Unless otherwise specified in these Terms, all information and screens appearing on this Site, including documents, services, site design, text, graphics, logos, images and icons, as well as the arrangement thereof, are the sole property of FAWNS, Copyright 2013 SOCIALIZING LLC. All rights not expressly granted herein are reserved. Except as otherwise required or limited by applicable law, any reproduction, distribution, modification, retransmission, or publication of any copyrighted material is strictly prohibited without the express written consent of the copyright owner or licensor.